The emerging class of always-on, always-connected PCs is modernizing how we use computers by emphasizing portability and longer battery life. Qualcomm and Microsoft are on the forefront, as they have partnered with various manufacturers to increase the adoption of Windows 10 laptops and hybrids. The idea is to provide a smartphone-like experience in terms of portability and battery life on notebooks, and now that 5G is just around the corner, Qualcomm has launched its first 5G chip so consumers can enjoy next-generation speeds on their PCs too. Back in December 2018, Qualcomm revealed its first 7nm mobile PC chipset, the Snapdragon 8cx. The chip was made from scratch for Windows 10 PCs, improving readily over the Snapdragon 850. It comes with an Adreno 680 GPU, a Kryo 495 CPU, a Hexagon 690 DSP, Wi-Fi support, a Snapdragon X24 LTE modem, and the Spectra 390 ISP. At the Mobile World Congress trade show today, Qualcomm revealed a new version of this chipset, called the Snapdragon 8cx 5G, which is basically a beefed up version of the Snapdragon 8cx that will come with the Snapdragon X55 5G modem, offering speeds of up to an unprecedented 7Gbps. The chipset will be released later this year, with Qualcomm’s partners expected to take advantage of it soon. Qualcomm believes that apart from providing faster speeds, 5G will also make it easier to store and access files on the cloud as it will offer higher bandwidth paired lower latency. This means as 5G becomes mainstream, we can start using cloud storage like local storage. This would give rise to remote computing and balance the speeds of the next generation of wireless networks with the performance of local processors. Given that carriers in various countries will start rolling out 5G networks this year, the 8cx 5G platform can make Windows 10 PCs look like a more worthy option than the rivals. Lenovo has already announced plans to use Qualcomm’s latest chipset to release a 5G-ready laptop, but the arrival of the machine will happen by early 2020. 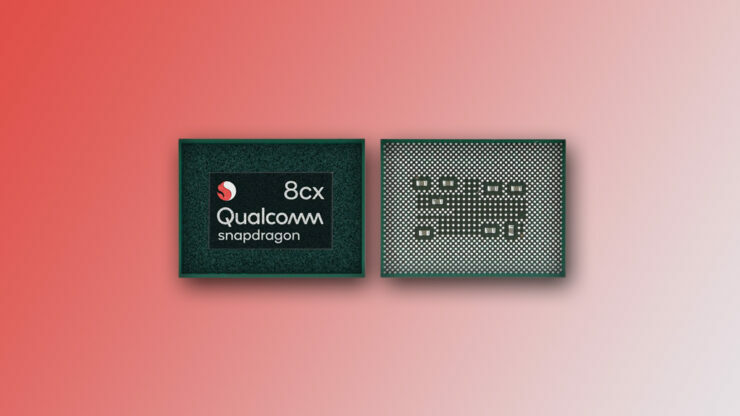 As for the Snapdragon 8cx, Qualcomm pitted the SoC’s performance as comparable to an Intel Core i5-8250U, a quad-core chip fueling current-generation ultrabooks. However, with Qualcomm claiming the Snapdragon 8cx to be up to 60 percent more efficient than the Snapdragon 850, users should experience improved battery life. Of course, we’ll have to see how the silicon performs with the first consumer-ready notebooks, as we’re looking forward to witnessing double-digit battery life without sacrificing too much performance in the process.